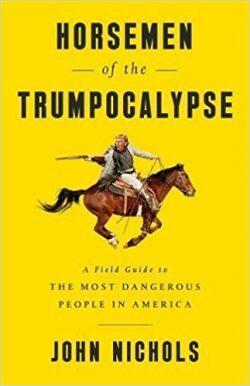 We talk with John Nichols about his book HORSEMEN OF THE TRUMPOCALYPSE: A Field Guide to the Most Dangerous People in America. We also talk with Valerie Brown, co-author of a just released report for the magazine In These Times on how Monsanto kept the EPA from regulating the toxic weedkiller glyphosate for over 40 years. John Nichols says that Donald Trump has assembled a rogue’s gallery of alt-right hatemongers, crony capitalists, immigrant bashers, and climate-change deniers to run the American government. People like Betsy de Vos, Scott Pruitt, Ryan Zinke, Stephen Miller and the rest of the President’s cabinet and appointments are a wrecking crew, he says, that Trump has unleashed on the very institutions that are supposed to defend the interests of the American people. His book Horsemen Of The Trumpocalypse is a highly readable compendium of skullduggery, conflicts of interest and ideological extremism that threaten to take America back to the worst abuses of the Gilded Age. John Nichols is the national affairs writer for the Nation magazine and a contributing writer for The Progressive and In These Times. He’s also a cofounder of the media-reform group Free Press. Horsemen of the Trumpocalypse is out in paperback from Public Affairs. Trumpocalypse Horseman Scott Pruitt isn’t the only one whose sold out the EPA to powerful corporate interests. It turns out Monsanto has been exerting influence over the EPA for decades to suppress information about the toxicity of its blockbuster chemical glyphosate, AKA Roundup. WV talk with journalist Valerie Brown about the article she co-authored with Elizabeth Grossman “How Monsanto Captured the EPA (And Twisted Science) To Keep Glyphosate on the Market.” It appears in this month’s In These Times.